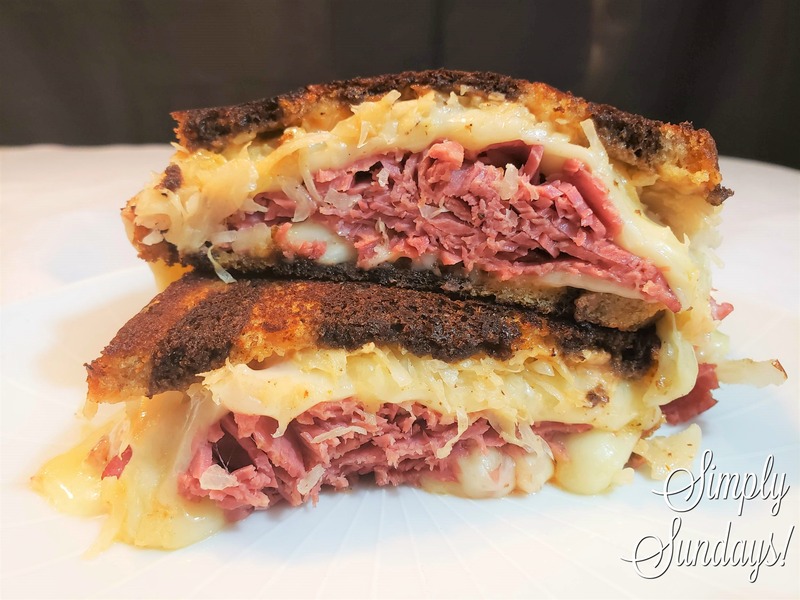 NY Deli Style Reuben – Simply Sundays! If layers of tender corned beef, melty swiss & slightly “sour” kraut slathered with creamy dressing and sandwiched between grilled marbled rye sounds good, then you’ve come to the right place! Truthfully, I have no idea where the Reuben sandwich originated from. Some say New York City, some say Omaha, Nebraska. Two guys each with the name of Reuben claimed the rights to this sandwich, but I’ll let them both fight it out. I believe the key to any grilled cheese sandwich is to have cheese on both sides of the ingredients. It kind of glues everything together and is well, more cheese! Add two more slices of cheese over the kraut, slather some more Thousand Island dressing on the non-buttered side of the bread and we’re ready to roll! All I know is that we’ve been eating these post St. Patty’s Day sandwiches since I can remember. I almost think I like the leftover version of our traditional Irish meal better than the corned beef and cabbage itself! I have never tried a reuben or marble rye bread! Love the idea of both! That looks like the best ever toasted sandwich! I am absolutely sure I am in the right place! 🙂 Just reading through your recipe made my mouth water. I think everything about this recipe screams “I am so unique, try me!” – I can’t wait to make it at home ASAP! Thank you Laura! Hope you love them! My family loves Ruebens! I am not sure why I haven’t made them at home! I can’t wait to try your recipe! Thanks! Thanks Beth! Let us know what you think! I’m suddenly soooo hungry! Such a great combination of flavors!! I’m drooling! Well I am from NYC so I will definitely claim the NYC camp Home to the world famous Katz’s deli with their Reuben sandwiches this is such a part of our NYC food culture. I’ve never attempted to make it at home myself, but your sandwich is definitely making me think I should or make a stop at Katz’s soon! This looks delicious. I can’t wait to make some sandwiches!